Tyler Adams is a former youth player of the New York Red Bulls. At the age of 16, he was already a starter of the New York Red Bulls II, playing games at the United Soccer League, the second tier of football in the USA. Two months after his 17th birthday, he has made his debut for the New York Red Bulls in the MLS. One season later he becomes a regular team player for the first team of the Red Bulls. In a total of 38 MLS games, he has scored 2 goals, made 5 assists and has got 4 yellow cards. If you look at his international career, you see Tyler Adams has played many international games in his youth. He has played in total of 35 games for USA U17 and USA U20 and also has 5 appearances for the USMNT. His debut in the national team was against Portugal, last November. He was only 18 years old. The media have announced Tyler Adams is going to German club RB Leipzig at the end of the current MLS season. This isn´t made official by both Red Bulls clubs yet. If you look at Tyler Adams you see he will stay calm when he´s having the ball. Also under pressure, he can make the right decision to do. He´s able to make a good dribble and find some free space, but because of his good vision, he can also pass the ball to a teammate. He regularly uses short range passes. This pass could be a one-touch movement, but he also can choose to accept the ball first and pass or dribble the ball after some touches. If you look at the defending side of the game, you see he´s very fast close to his opponent, so his opponent doesn´t have the time to control the ball correctly. Tyler Adams can also tackle very well, but he only does this when it´s necessary. Although he isn´t a tall player, he wins most of the heading against his opponents, but it´s fair to say his directly opponents aren´t that tall neither. Tyler Adams players normally at the centre of the field, but because he´s good in choosing the right position, you´ll also see him play at the left or right side of the pitch. His good positioning is both defensive and offensive, so he´s often at the right place at the right moment. Because of that, he´s able to put some serious pressure on opponents when they have possession. Adams is a very determined player who does anything to reach the top, according to people around him. In the game, he always keeps going, especially in defending situations. With his personality, he could become a good leader of his team. He´s coaching teammates to get in position or to mark a certain opponent, but he could also talk to the referee or opponents. These conversations are generally positive, he´s not complaining much. With his 1,75 m and 68 kilograms, he isn´t very tall, but that doesn´t influence his strength. In personal duels, he can show this strength, especially when the ball is on the ground. He is also a quick player, but his superb stamina could be the physical ability he´s showing the most. He´s never giving up and always be able to get in a good position or to solve any defending or attacking problems. 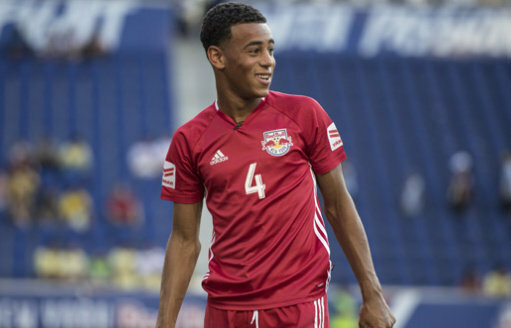 Tyler Adams has played 53 games with New York Red Bulls. In all those games he scored 3 times and has 6 assists. That´s almost an involvement of one goal (goal or assist) every six games. This season he has no goals and assists in the MLS, after 10 games, and he also has 0,6 shots per game and 0,4 key passes per game. If he wants to be more important for his team, he could improve his involvement in offensive plays of his team.